We offer modern and elegant apartments in a brand new building with ideally location in the city centre, easy walking distance of Budapest's attractions, the largest Synagogue in Europe and the famous promenade, the Andrassy Avenue. This famous promenade is part of the UNESCO Heritage, excellent transport links and iconic architecture. The area supplies an array of nightlife, including restaurants serving a variety of cuisine. We are also near to the leisure facilities and the famous pedestrian area, the Vaci street and Deak ter/square (M1, M2, M3). • Children friendly services: Babybed, high chair and babytub are free of charge upon request (by the reservation). One child under 4 is free of charge in their parents' room; 2 children under 4 costs the price of one extrabed. • Internet service: all apartments has a Wireless Internet free of charge. • Parking possibility: in the underground garage of the building upon request (by the reservation). The daily ticket costs 14 EUR; the 3-days ticket costs 30 EUR. • Pets are allowed, except for the Superior apartment with 150 EUR deposit (by the reservation). • The apartments are suitable for handicapped persons with an assistant. • Sightseeing tours; citymap and cityguides; shuttle service by minibus or car are available in the office of teh apartments. • The price including: duvet with cover, pillow with cover, sheet; one towel size medium/person, little towel for hand in the bathroom, liquid soap, toilet paper, detergent. • The hotel's own parking lot is available for the guests at 15 EUR per car per day. 32-34 m² in size, modern studios. Matrimonial bed, pullout sofa or 2 chairs and a TV set can be found in the unique spacious room. American-style kitchen, open and well equipped (fridge, microwave, electric oven, coffeemachine, toaster, dischwasher, plates, knives and forks, etc.). There is a shower, toilet and washing machine in the bathroom. The studios have natural light, parquette and tiles on the floor. One of them has a balcony and WIFI, the other has air-conditioining. 55 m² two-room modern apartments. There is a double bed in the bedroom, and two fold-out sofas in the living room. Kitchen is fully equipped (fridge, microwave, electric oven, plates, knives and forks, etc.) TV, radio and dining table in the living room. The bathroom is equipped with a bath and a washing machine. Toilet in a separate room. Two of the 4 apartments are equipped with air-conditioning. Parking possibility: in the underground garage of the building. This is a modern, 76 m² size 3-rooms apartment. There is a one-one double bed in the bedrooms, and a fold-out sofa in the living room. There is one single bed in the bigger bedroom. The flat is ideal for max. 6+7 persons. Kitchen is fully equipped (fridge, microwave, electric oven, coffeemachine, toaster, dischwasher, plates, knives and forks, etc.) cable TV and dining table are in the living room. The bathroom is equipped with a bathtube with shower and a washing machine. The toilet is separated from the bathroom. There is a balcony, the apartment is with air-condition. The flat is equipped with new designe furnitures. Parking possibility: in the underground garage of the building. 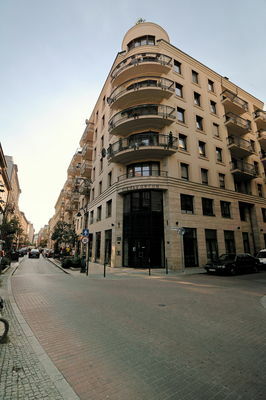 This is a modern, 74 m² size 3-rooms apartment int he Király street. There is a one-one double bed in the bedrooms, and a fold-out sofa in the living room. The flat is ideal for max. 6 persons. Kitchen is fully equipped (fridge, microwave, electric oven, plates, dischwaser, knives and forks, etc.) cable TV and dining table in the living room. The both bedrooms has a bathroom, is equipped with a bathtube with shower, toilet and a washing machine. There is a balcony, the apartment is with air-condition. The flat is equipped with new minimal styles designe furnitures. Parking possibility: in the underground garage of the building.